Blog & Journal > Technology > What is Custom Web Application Development? The web applications are built specifically for businesses to market their product and services. It offers a variety of solutions to businesses belonging to different categories; however the motto behind every service is a strong brand image, superior online presence and higher return on investments. Every business, irrespective of their size follows a proper process that makes the daily activity easy. However, there are still some hindrances like the departments are segregated into different sections, which makes the information sharing and data transmission difficult. Also, it leads to lots of communication gap between customer and service providers. In that case, having applications that could that can be easily customized to suit your business needs is a boon. The customized web application development helps in streamlining your business activities and controls the interaction between employees and customers. When your business or any process requires supplementary functionality, customized web application development by a specialized development or company could help you manage the business process. 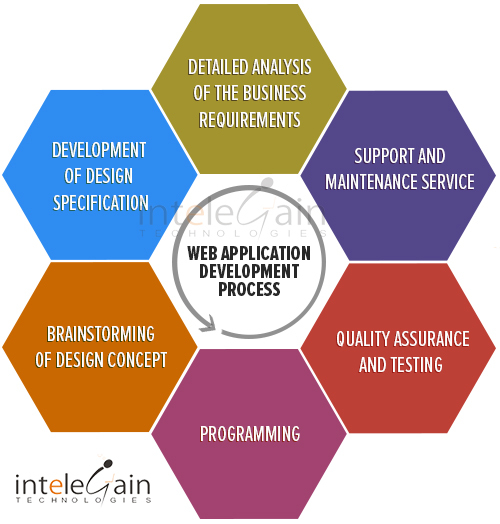 The application creation for web provides flexibility in terms of custom development. This is just a general process followed by every development company. The process however is not restricted to these points. There are a lot of demand and competition in the web app arena, therefore create an app that is unique and different in terms of usage, design and other factors. The development company does not just create app, but they also specialize in creating website, which will be appealing to the users. The website obviously should be visually delighting because that is the first thing users/customers will look into. For app development, the developer should first bifurcate the stages and start with the most important one first. However, the priority should be given to the analysis of industry, which includes business nature, market and target audience, competitors and application customization. The layout, design and quality are the three most important thing of every app development process.